Sleepover and Slumber Parties	are always fun and with these great ideas and fun things to do at a sleepover the slumber party is sure to be a success! Fun things to do at a boy's sleepover / slumber party ! Fun pajama party ideas for Invitations, Activities, Sleepover Games, Food, Tips and what to do the morning after the Sleepover for 5, 6, 7, 8, 9, 10, 11, 12, 13, 14, 15, 16, 17 and 18 years old. 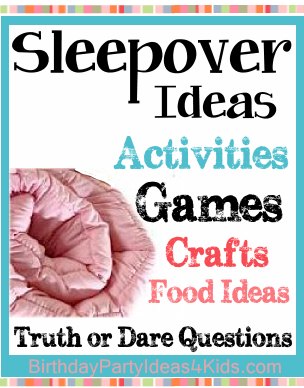 Sleepover ideas for teens, tweens and older children. Great sleep over ideas for girls of all ages. items from your kitchen and also funny (and free!) truth or dare questions to print out (for all ages - rated G) and some great crafts to keep everyone busy and having fun! It's easy to send out great slumber party invitations to all of your friends. You can either buy great looking invitations with pictures of sleeping bags, flashlights, pajamas, fuzzy slippers, etc. or make them yourself. If you want to make your own - look for fun clip art or coloring book pages to copy the images you want onto colorful blank cards. Buy plain pillowcases and write the slumber party information on the pillowcase (not too large - in a corner of the pillowcase or attach party information separately) and ask that they decorate one side of the pillowcase with their name and bring it to the party. During the party have everyone sign each others pillowcases on the back. Get creative with the sleepover invitation and cut out heads from pictures of you and your friends and then paste them to the invitations. Make it look like you are sleeping in a sleeping bag, wearing big fuzzy slippers or having a pillow fight. Sleepover Invitation idea: Create little pillows by folding squares of felt or craft foam in half to make pillow cases. If you don’t sew, use a stapler, glue gun or fabric glue to secure the side and bottom edge of the pillow case. Stuff with a little cotton. Write the invitation on a 3 x 5 card and slip it into the pillow. Text: WHAT HAS 12 LEGS, GIGGLES AND STAYS UP ALL NIGHT? MY SLEEPOVER PARTY, AND YOU'RE INVITED! What to bring: Sleeping bag, pillow, bathing suit, towel, anything special that they will need for the party. Place of the Sleepover: Make sure to write in your address. Friends might know where you live, but parents will want to have this information. Hint: You might want to draw a map on the back of the invitation. Telephone number and/or Email for RSVP: Make sure to write in your telephone number. Parents will want this too. If you will be serving dinner, pizza or snacks (so your friends will know whether to eat or wait until they get to the party to have dinner). Example - We will be having pizza! As a courtesy you might want to ask on the invitation if the invitee has a food allergy - ask the parent to contact you so you can plan accordingly. The best sleepover games to play at a slumber party! There are 35 fun games on our Minute to Win it games page! Fun and challenging games - great for slumber parties! - Sit in a circle and ask each other truth questions. If the person you ask doesn't want to answer the question then they must do the dare. We've made a fun list of free clean (rated G) truth or dare game questions for you to print out for sleepovers. Choose bright and bold nail polish colors for this game. Start by removing everyone's nail polish so everyone's has polish free fingernails. Put all the bottles of polish in a pretty basket or container and set them in the center of the circle of girls. The first sleepover girl starts by choosing a color of fingernail polish. She lays it on it's side and spins it around. When the polish stops spinning the girl who the cap is pointing towards has to paint one of her nails that color. (For a variation you can also have the girl who the cap lands on roll one dice to see how many nails she has to paint that color. ) When she is done painting her nail(s) she chooses a color out of the polish basket and spins it. Paint your toes too to make the game last longer. This is a fun fashion dress up game! Make your most fabulous outfit out of aluminum foil and have a Project Runway contest. In this dress up game players each receive a roll of aluminum foil for their creations. Set out a table full of other items they can use to style their fashions such as ribbons, plastic flowers, etc. Girls have to create a complete fashion look (for fun you can set a theme such as beach wear, evening dress, wedding dress, sportswear, etc. ) Anything can be crafted from the foil - dresses, skirts, tops, shorts, pants, evening wear, sunglasses, tiaras, belts, high heels, jewelry ... the options are limitless! Have a fashion show and judge the fashion creations - be sure to take pictures! The perfect slumber party makeover game with a twist! The first person puts on a blindfold and does the makeup of the second person. Then when they are done the second person puts on the blindfold and does the makeup of the third person. Draw numbers to determine the order. Really funny - take pictures so you can keep the memories. Song Maker Game - Pick one person at the sleepover to go first for the game. Everyone in the group decides on a title of a song and then the person chosen first must make up a song to go with that title. Example: Little bunnies on my pillow. Fill shopping bags with 6 different items in	each bag. A shoe, hat, party favor etc. - each bag should be filled with different items. Divide into teams and give each team one bag. Go to separate rooms to make up a skit which includes all items in the bag. After 15 minutes come back and perform. Variation: Create a TV commercial or song. On the invitation ask everyone to bring an inexpensive item or a "white elephant" (something in good shape they don't want anymore) wrapped or sealed in a bag to the sleepover. Give the everyone $100.00 in play money and start an auction for the unwrapped gifts. Hold up the first sealed bag and ask who will give $1 for it... and so on. For fun you can add food and gag gifts to the auction items. Keep the items sealed and don't let anyone know what is inside until the high bidder opens the item. At the end you can trade bags or buy each other's presents with their left over auction money. With any other left over auction money you can bid on who gets to pick where they want to sleep, what game you play next, first dibs on the biggest piece of cake or who chooses the music to listen to. This sleepover game is played with m&m's, skittles or any small candy that comes in different colors. Place candy in a bowl. Sit in a circle and ask the guests to choose 2 candies - without looking. Show them to everyone and then put them in your mouth ... if they are the same color then you can chew them, if not you have to hold them in your mouth until your next turn when you can try and choose 2 more of the same color. You can't chew until you get 2 of the same color. This game really gets you involved ... because you are the piece that moves around the board. On a large patio, driveway or other cement area draw a VERY big board with sidewalk chalk. Each square should be about 18". It can be a circle, oval or figure 8. Inside each square, beginning with the start square, write different things to do if someone lands in that square. Some fun ideas are: Move ahead 4 spaces, Jump back 3 spaces, Bark like a dog, Narrate the game, twirl like a ballerina, etc. Use regular dice or make your own from large boxes. A player rolls the dice, then moves themselves (the girls are the playing pieces) along the game board - when you land on a space then read what it says and follow the instruction. This sleepover game is also fun to play with flashlights at night! Buy a large inflatable beach ball and in permanent marker write questions all over it. Place everyone in a circle and throw the ball to someone. The person who catches the ball must answer the question that their right thumb is touching. After answering the question they then throw the ball to another person. Ask everyone to bring a flashlight (or provide them for everyone) to the slumber party. Before everyone arrives at the party ask a parent or sibling to hide candy all over the yard. When it gets dark have everyone take their flashlights outside and hunt for the candy. Think of fun things that go with your slumber parties theme and write them down on pieces of paper. Divide your friends into two teams. The first team picks a player to act out a word. The player chooses a word - but doesn't show their teammates. The player then tries to act out the word while her teammates try and guess what she is acting out. If they guess the word the team gets 1 point. Set a timer for 3 minutes - if the team can not guess the word in 3 minutes then the other team gets one guess at what the word is. If they are right they get the point. Play to 10 points. More Games just for girls! Buy inexpensive t-shirts or tanks (you can also ask on the invitation for each girl bring one from home) and provide lots of fun iron on letters in different fonts for everyone to use. It's fun to come up with crazy sayings and make matching t-shirts to remember the party. ** Make sure to wash and dry the t-shirts before guests arrive so the iron on's will stick. Super fun and easy - perfect for sleepovers! See our	funky flip flop page for complete directions and more pictures! Use permanent markers (you are able to sleep on them that night) or fabric pens and have guests sign each others' pillowcases during the slumber party. Decorate and doodle to create a masterpiece. You'll remember how much fun you had with your friends every time you go to sleep. 8 Mall Scavenger Hunts to choose from! All have free lists to print out and most require no items to be purchased. Try the Freebie Mall Shopping Spree with a list of over 40 items you can collect FREE at the mall!The mall scavenger hunts are extra fun as a slumber party at a hotel idea! Lots of fun at slumber parties! We've included free lists filled with fun items to find! Complete instructions for an easy to make tutu. No sewing required! All you need is tulle and ribbon! with foam cut-outs, stick on jewels or paint. with paints, foam stickers, jewels, pieces of feather boas, glitter, etc. Take pictures of you and your friends at the sleepover and place them in the frames. includes a great chocolate facial mask! Make this the theme of your slumber party. Chocolate everything! Send out brown and pink polka dot or striped invitations and scent them with chocolate perfume, light chocolate scented candles, paint each others fingernails and toes pink with brown polka dots, serve hot chocolate and smores, provide chocolate scented facials and masks and chocolate lip gloss ..... yum! Let everyone have a turn at singing. Play American Idol and set up judges to vote on the best performance. Give each other makeovers then take pictures. These can also be funny makeovers and everyone must keep their crazy look through the rest of the party. Facials, Peels and Masks are fun and great for your skin. Homemade Spa Recipes - make your own spa recipes with things you have in your kitchen! Easy recipes for great facials. Use colorful pompoms, googly eyes, pipe cleaners, felt, and foam to create cute little pets. Then, have a pet show! Pizza - take out or have more fun making your own with fun toppings. Make pancakes and top them with strawberries, chocolate chips, sprinkles etc. Have a chef challenge - give everyone a "mystery" ingredient they must use in their breakfast dish. Buy extra	toothbrushes and keep them unopened in a drawer in case someone forgets to bring one to the sleepovers. Don't invite too many guests to sleep over at one time - too many personalities increases drama! Up	to 5 is usually fine, more if they all know each other and get along. Serve healthy snacks along with the junk food for a balanced sleepover. - 8 different mall hunts with free clue lists! 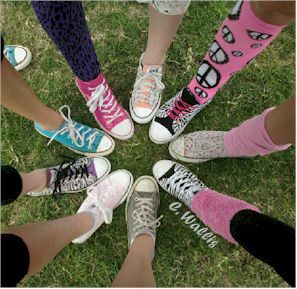 Teen party ideas fun theme ideas for your bday slumber party sleepover. Now you know what to do at sleepovers ... but we are always looking for more ideas! Send us your Sleepover games, dyi ideas, pajama party ideas, fun things to do at a sleepover and activities for 5, 6, 7, 8, 9, 10, 11, 12, 13, 14, 15, 1, 17 and 18 year olds.